No contemporary songwriter has had a greater effect on my life than Andrew Peterson. His first album appeared the year I moved to Romania as a missionary student, and since that time, his songs have become part of the soundtrack for my life and faith. Andrew’s work resonates with me for several reasons. First, Andrew expresses a childlike wonder toward this world and our place in it, waking us up and seizing our imaginations until we see—truly see—the wonders of existence. I gravitate toward music and books that lead me in the way of wonder. Second, Andrew’s albums are steeped in biblical allusions and Scriptural imagery—all of which grow more powerful the more you study Scripture and the more you put his songs on “repeat.” There’s a richness to his lyrics that rewards the contemplative listener. Third, Andrew’s songs bear the mark of authenticity, giving voice to a faith that is firm in its grasp of the truth and yet honest in its experience of doubt or suffering. The result is a compelling portrait of Christianity in all of its messy glory. In recent years, I’ve had the opportunity to spend some time with Andrew here and there (including an unexpected lunch one afternoon in Cambridge! ), and even though I’ve expressed to him my gratitude for his musical labors, I’ve long wanted to pay tribute with words of my own, in hopes that I might introduce others to his work. So, in this guide I walk through each of Andrew’s albums, providing a brief overview and some thoughts on each offering. If you’re new to Andrew Peterson and don’t know where to start (and if the guide below—which swelled to nearly 7,000 words—seems a bit much), here’s my recommendation. If you’re most intrigued by my comments above about childlike wonder and imagination, I recommend you start with Counting Stars. If you’re most interested in the biblical allusions in his work, I recommend his newest album, Resurrection Letters Volume 1. If you find the marks of authentic faith most appealing, I recommend my personal favorite, Light for the Lost Boy and/or Love and Thunder. 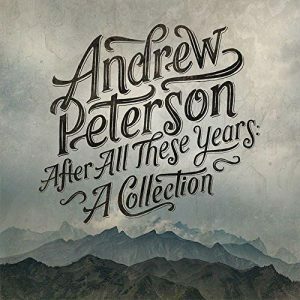 Any of these albums will serve as a worthy introduction to the rest of Andrew Peterson’s work, which I’ve done my best to pay tribute to below. Andrew Peterson’s debut was released in 2000, and it sets the stage for the rest of Andrew’s work, both musically and lyrically. “Nothing to Say” is a song of praise to the Creator, inspired by a drive through Arizona while “Rich is on the radio.” (This is a nod to Rich Mullins, the singer songwriter who left an indelible mark on Andrew spiritually and musically.) In several of the songs on this album, Andrew highlights the persistent grace of God that flows to undeserving sinners. “In stubborn spite of my stubborn spite, I am loved nonetheless,” he sings in “Love Alone,” and the album’s closing song, “The Ninety and Nine” recalls Jesus’ parable of the lost sheep and then launches into an Irish jig as the album’s musical finale. “Shiloh” and “Rise and Shine” introduce a formula that will be used often on Andrew’s albums: an ordinary experience, image, or object gets transposed into the spiritual realm. In this way, an ordinary experience (such as a parent calling you home in “Shiloh,” or the announcement of daybreak in “Rise and Shine”) points to an aspect of the gospel. It feels like the church isn’t anything more than the second coming of the Pharisees scrubbing each other ‘til their tombs are white. Characteristically, Andrew’s prophetic vision turns inward, where he sees his own lingering sins and utters a heartfelt cry for Jesus to return and make things right. This yearning for the world to be made new will become a frequent theme in his music. 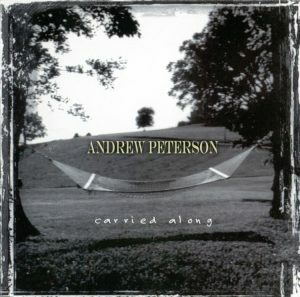 Carried Along was my first introduction to Andrew Peterson. I had been a fan of Caedmon’s Call for several years, and their platforming of Peterson piqued by interest. (Somewhere there’s a video of me singing “The Chasing Song” at my church!) The longer I’ve lived with this album, the more I’ve appreciated it for how it sets the stage for Andrew’s future work. Musically: elements of folk and pop. Lyrically: awe and wonder at God’s creation and redemption. Carried Along is a strong debut album. The “sophomore slump” refers to the frequency with which a second album fails to live up to the standards set by a strong debut. Most singer/songwriters spend several years developing their craft and perfecting their best songs. Once they get a record deal, they fill their first album with the best of their initial work. But then comes the deadline for a second album, and the lack of intervening time leads to a less impressive result. Complicating matters for Andrew Peterson is the timing of his second album’s release. Clear to Venus debuted on September 11, 2001. Imagine trying to launch a record on that day, or trying to get traction with a new batch of pleasant songs in the post 9/11 culture. Clear to Venus may be Andrew’s most “forgettable” album, but it is still far from bad. Musically, he leans away from the folksy roots of Carried Along and instead mixes more pop and country, giving the piano more prominence here than on his other albums. Lyrically, Clear to Venus doesn’t have the sense of gravity that Carried Along did, but this sophomore release still has a charm of its own, and the music has aged well. The strongest song comes first, “No More Faith,” which places human doubt against the backdrop of the coming day when faith and hope are no more, and love alone remains. 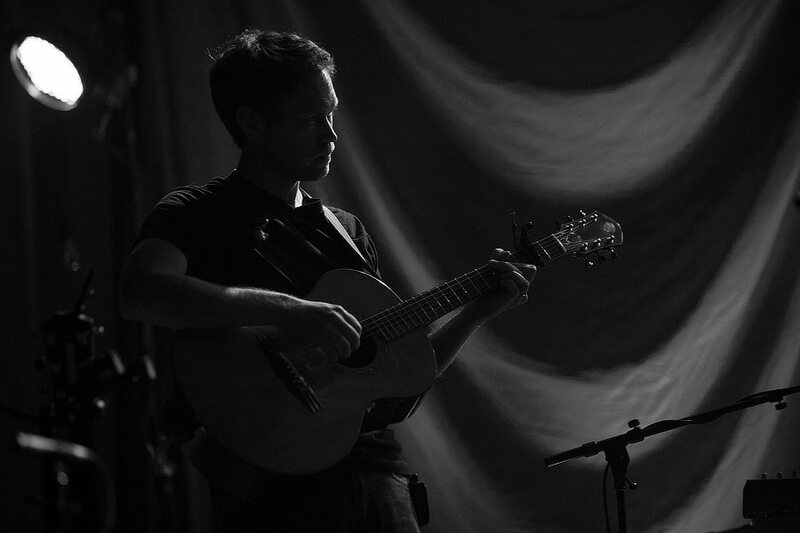 The bridge features a technique that Andrew will use more frequently on subsequent albums: a quiet expression of determination that builds to a declaration of faith before launching back into the chorus. Clear to Venus is not as strong as Carried Along. It is an album “born of the road,” as Mark Geil put it. At times profound, always pleasant, it is a good album overshadowed by Andrew’s better work. Oh, Sarah, fair and barren one, Come to Canaan, come. How faith compelled and bore us on How barren Sarah bore a son. In “Let There Be Light” and “Serve Hymn,” Andrew returns to the folksy bluegrass of Carried Along while building on the themes of sin and grace and service found on Clear to Venus. “Pillar of Fire” continues the journey motif of “Canaan Bound,” giving voice to a spiritual traveler whose nighttime doubts threaten to overtake him. “Just As I Am” is an album highlight, notable for the startling imagery and beautiful theology of conversion. What’s that on the ground? It’s what left of my heart. Somebody named Jesus broke it to pieces and planted the shards… and they’re coming up green, they’re coming in bloom, I can hardly believe this is all coming true. The song ends with Jesus returning to see the harvest and declare His unmerited love. The best that I’ve got isn’t nearly enough He’s glad for the crop, but it’s me that He loves. The next two songs shift our attention to family life. “Family Man” expresses Andrew’s surprise at his embrace of the role of husband and father. “Tools” pays tribute to Andrew’s grandfather, a veteran of WWII who passed on his faith before passing away. “High Noon” is an Easter song—an echo of “Rise and Shine” from Carried Along and a preview of Andrew’s later work on the resurrection. The song imagines the valley of the shadow of death “shot through with light” when “Jesus took in that breath and shattered all Death with his life.” Andrew’s lyric links Christ’s resurrection to his own conversion. So long, you wages of sin, Go on, don’t you come back again. I’ve been raised and redeemed, All praise to the King, the victor of the Battle. The songs at the end of this album express the ache of living in a world where evil persists. “The Silence of God” lays bare the state of one’s heart when it seems God is absent, and then turns to the experience of Jesus, the Man of Sorrows. “After the Last Tear Falls” runs through a litany of contemporary evils and sorrows before proclaiming this truth. And in the end, the end is oceans and oceans of love and love again We’ll see how the tears that have fallen were caught in the palms of the Giver of love and the Lover of all and we’ll look back on these tears as old tales. The song ends with a musical return to the melody of “Canaan Bound,” bringing the album full circle and to a fitting close. 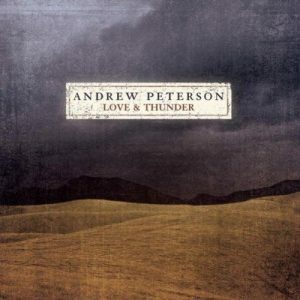 Love and Thunder shows Andrew Peterson’s development as a singer and songwriter with a style and substance of his own. I echo the sentiments of Eric Peters: “delicate in its haunting, beautiful in its sorrow, rich in its questions, fertile in its proclamation of faith and doubt, and painstakingly glorious in its production.” The lyrics on Love and Thunder are imbued with theological and biblical significance, and the album’s folk/pop style still sounds fresh. How to describe Andrew Peterson’s masterpiece? It’s not accurate to say this is only a Christmas album (since the first half tells the story of the Old Testament). Neither is it a musical. (even though the songs are sequenced intentionally and several musical motifs resurface throughout the album). My best shot at describing Behold the Lamb is to say it’s a musical rendering of the story of the Bible, leading up to and through the birth of Christ. Joined by other musicians and singers, most notably Derek Webb (“Deliver Us”), Jill Phillips (“Labor of Love”), and Fernando Ortega (“Behold the Lamb of God”), Behold the Lamb of God is like a classic film—it gets better every time you encounter it. The 2014 re-release includes the live performance (and if you ever get the chance to see this production in concert, do yourself a favor and make a memory you won’t forget). In a single song, “So Long, Moses,” we move from the wilderness wanderings all the way to the prophets. Verse 1 transitions from Moses to Joshua, with the haunting cry for a coming king. Verse 2 takes us to Saul and David, where the kingdom is established. In verse 3, “the kingdom is broken now,” and the prophets cry out to God. The song ends with the promise of Isaiah 53 set to music and Micah’s prophecy about the King’s birthplace. The next two songs (“Deliver Us” and “O Come, O Come Emmanuel”) linger among the cries of the Jewish people before the coming of Christ, with “Deliver Us” also foreshadowing the lament of Jesus over Jerusalem in Matthew 23. The second part of the album tells the Christmas story, beginning with the genealogy of Jesus set to a rollicking folk song (“Matthew’s Begats”). “It Came to Pass” carries the story along by giving the backstory of Mary and Joseph. Since its release, Jill Phillips’ “Labor of Love” has become an often-covered Christmas song for the beautiful way it describes Mary’s embrace of the pain of childbirth. It was not a silent night There was blood on the ground… And the stable was not clean And the cobblestones were cold And little Mary full of grace With the tears upon her face Had no mother’s hand to hold. The second verse highlights the nobility and strength of Joseph, and then the song turns attention to the Baby in Mary’s womb. It’s hard to describe the power of Behold the Lamb of God if you’ve not experienced the performance in concert. Full of biblical allusions and echoes, this album’s undistracted focus on the story of God and His people provides an opportunity for Christians to ponder anew the wonder of the incarnation. Like Love and Thunder, this album begins with Abraham. Father Abraham Do you remember when You were called to a land and you didn’t know the way? The album’s title comes from a line from Meister Eckhart (“God is at home. We are in the far country.”), and the theme of wandering as strangers and sojourners in this foreign land is evident throughout the songs. We ache for what is lost As we wait for the holy God. “Mountains on the Ocean Floor” is a somber song with a flicker of hope that God may be doing more in the lives of broken people than we could imagine. “All Shall Be Well” turns to examples from nature to show how “the Word of God will never fail” and the end of the story is assured. “For the Love of God” is a tribute to those who serve others in the name of Jesus. The album’s closing track, “More,” is a thematic cross between the last song on Love and Thunder (“After the Last Tear Falls”) and the song that will close Light for the Lost Boy (“Don’t You Want to Thank Someone”). 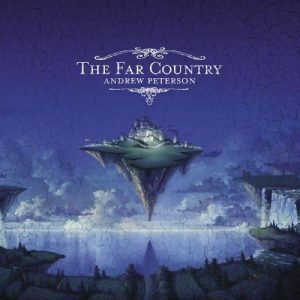 Although The Far Country is a fine album, I’d rank this one as non-essential when compared to Andrew’s other offerings. The songs blend together musically and lyrically, giving the album an admirable cohesiveness but at the expense of any songs that stand out as most excellent. Furthermore, Andrew’s theological exploration of “heaven as our home” will undergo a revision in later albums (see “Day By Day” for example on Light for the Lost Boy), after his imagination is captured more by the promise of new heavens and new earth. 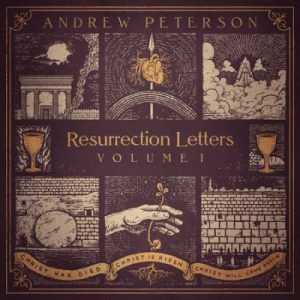 Andrew Peterson’s first resurrection-themed album (named Volume 2 because he realized while crafting it that he would need to reserve space to come back and do more on the cross and resurrection) is less a narrative retelling of Christ’s death and resurrection and more an exploration of its significance. “All Things New” kicks things off with the call to “rise up you sleeper, awake!” and trust in the Jesus who “makes all things new.” The lyric announces “the dawn is upon us,” and the bridge sums up the Bible’s overall storyline. The world is good The world is fallen The world will be redeemed. “Hosanna” is one of Andrew’s greatest songs. It combines an energetic, joyful melody with a haunting and ache-filled cry for salvation, stark in its assessment of the human condition. I am tangled up in contradictions I am strangled by my own two hands I am hunted by the hounds of addiction I have tried to fall when I could stand… I have nursed the beast that bays for my blood. But the starkness of this sinful state is overcome by the triumph of Jesus over the evil one. You have crushed beneath your heel the vile serpent You have carried to the grave the black stain You have torn apart the temple’s holy curtain You have beaten Death at Death’s own game. “All You’ll Ever Need” is a quiet song of praise that celebrates the blood of Jesus and how growing in faith means continuing to learn just how desperate we are for God’s grace. “Invisible God” glorifies the God who shows Himself in the works that He has made. In “Hosea,” Andrew sings the part of Gomer, Hosea’s unfaithful wife, who prostitutes herself and runs away from her patient and faithful husband. The middle part of this album contains several pleasant songs that aid in quiet reflection on life in light of God’s salvation. “Love is a Good Thing” describes love as tough and enduring. True love blows up our view of freedom yet leaves us with something better. “Don’t Give Up on Me” is a cry for patience and perseverance through sanctification, as the “holy fire of love” burns us and makes us clean. “Rocket” is the most light-hearted song on the album, capturing a child’s imagination in wanting to escape from being “stuck down here.” “Windows in the World” invites you to open your eyes to glimpses of redemption and hints of eternity in films and experiences (and even in weather patterns). In “I’ve Got News,” Andrew informs the listener that he isn’t what he seems to be. We see the singer at his best, not his worst. But by the end of the song, the line “I’ve got news for you” has shifted away from a confession of sin to the promise of the gospel to change our hearts and make us new. “The Good Confession (I Believe)” closes out the album with Andrew’s story of his conversion, his subsequent wandering and return, and a triumphant commitment to be faithful to death. 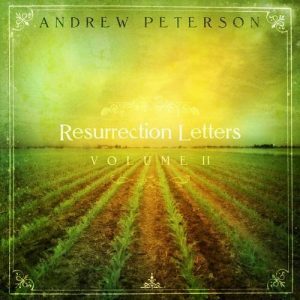 Resurrection Letters Volume II may not be Andrew Peterson’s best album, but it has long been a favorite of many fans due to its inclusion of some of his greatest songs (“All Things New,” “Hosanna,” I’ve Got News” and “The Good Confession”). This is the album that launched the next phase of Peterson’s career and laid the groundwork for Resurrection Letters Volume 1 (which was released ten years later). Many fans of Andrew Peterson rank Counting Stars as his greatest album. I find that assessment intriguing because this album doesn’t have a large number of songs that I’d include on an “essential” Andrew Peterson playlist. But I admit there’s a magic in this collection as a whole. Counting Stars invites us to interpret life in light of eternity and to make sure we don’t miss the beauty that’s right before our eyes. It’s easy to see why it is so beloved. “Many Roads” opens the album just as Andrew has often opened his concerts, with a quiet invitation into the world that he will create with his songs. He points to the sovereignty of God in directing the “many roads” it takes to bring people together, inclining those of us listening to sense that our presence at a concert or our attention to this album is part of God’s master plan. But even as the song explores the beauty of destiny, a shadow falls when Andrew admits his fear of rejection. As I cast out all these lines so afraid that I will find I am alone, all alone. “Dancing in the Minefields” is one of the best songs about marriage to appear since the advent of Christian Contemporary Music, and it even made a splash on Christian radio (which has never taken kindly to Andrew’s folk music or contemplative lyrics). The song expresses the challenges of marriage and celebrates the enduring nature of the vow. We went dancing in the minefields We went sailing in the storm And it was harder than we dreamed But I believe that’s what the promise is for. The next song compares different spheres of life to the fruit that comes from “planting trees.” It begins with the image of literal tree being planted, moves on to tell the story of a family that adopted an orphan son, and ends with the picture of a mother “watering” her family “with love.” “Planting Trees” beckons the listener to consider the future fruit that will come from our present endeavors. And many years from now Long after we are gone These trees will spread their branches out And bless the dawn. “The Magic Hour” describes the charm of Andrew’s home, by inviting us once again to look at the world and revel in the enchanted nature of existence. “World Traveler” is another album highlight. It starts with Andrew’s longing to be cut loose from home to travel the world, but then turns to the way marriage has led Andrew to walk “the hills of the human soul” and ends with an affirmation of fatherhood. Tonight I saw the children in their rooms Little flowers all in bloom Burning suns and silver moon And somehow in that starry sky The image of the Maker lies Right here beneath my roof tonight. “Isle of Skye” – a gentle lullaby Andrew wrote for his daughter – closes out the first half of the album, which so far has focused on opening our eyes to see the beauty of what is right before our eyes. The following song “In the Night My Hope Lives On” is a favorite of mine. The minor melody is played to great effect with bluegrass-tinged instrumentation, while the lyrics are filled with Bible characters and stories of faith. “You Came So Close” and “The Last Frontier” are songs of lament. The former calls out to someone at the end of their rope, while the latter mourns the singer’s coldness of heart. Until now, this album has focused primarily on seeing the enchanted nature of a good world overseen by the sovereign Father, but these two songs acknowledge the reality of people who feel surrounded by darkness and despair and are unable to see the beauty. “Many Roads” opened this album quietly. “The Reckoning” finishes it loudly, with the psalmist’s cry “How long” carrying the chorus. The song is full of paradox (“How I fear you, How I long to be near you”), and includes a bridge that describes line by line the paradoxical nature of God. You are holiness and grace You are fury and rest You are anger and love You curse and you bless You are mighty and weak You are silence and song You are plain as the day But you have hidden your face. 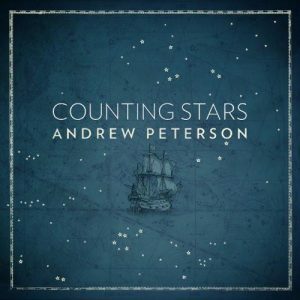 From beginning to end, Counting Stars captures Andrew Peterson’s ability to fuse theological depth with an affirmation of this world’s enchanted nature, marrying celebration and lament in interlocking ways that strengthen the listener’s experience of both. A true gem! Compared to previous albums, Light for the Lost Boy represents a musical leap. From the opening of “Come Back Soon,” we realize that we’re in unfamiliar territory, with “the sound of the scream and the sight of the blood” as an animal is caught “in the jaws of the dog as the river ran by.” The lyric is darker, and the music louder and edgier than the folksy style of Andrew Peterson’s previous work. The opening song describes a world in groaning, and then cries out for deliverance into the new world that God has promised. “The Cornerstone” is another song that sounds strikingly different from Andrew’s previous albums. The lyrics explore both the repelling and compelling nature of God’s self-revelation. We run up against the hardness in Jesus’ teaching, but then are surprised when we “collide with a beautiful immovable force,” the Cornerstone from which all rivers flow. “Rest Easy” returns to familiar Andrew Peterson territory—a grace-based song to his children that reminds them of their father’s acceptance. You don’t have to prove yourself you’re already mine You don’t have to hide your heart I already love you I hold it in mine So you can rest easy. “The Voice of Jesus” describes what C. S. Lewis called joy – “when the joy that you feel leaves a terrible ache in your bones” and Andrew connects that feeling to the “voice of Jesus” calling the sinner home. “The Ballad of Jody Baxter” is inspired by Marjorie Rawlings’ book The Yearling, with a powerful image of a little boy “who’s lost out in the woods always looking for the fawn.” Andrew uses the yearning for lost innocence in Rawlings’ work as the basis for expressing the longing for the innocence of Eden felt in every human heart. The second part of Light for the Lost Boy starts with the upbeat “Day By Day,” another song that yearns for childhood, but here Andrew admits that it’s not merely a return that we long for, but immortality. I don’t want to go back I just want to go on and on and on. The vision of eternity in this song differs in emphasis from the songs on The Far Country. Here we find an earthier, more resurrection-focused afterlife, perhaps due to the influence of N. T. Wright’s work. Go back, go back to the ancient paths Lash your heart to the ancient mast and hold on, boy, whatever you do to the hope that’s taken ahold of you. 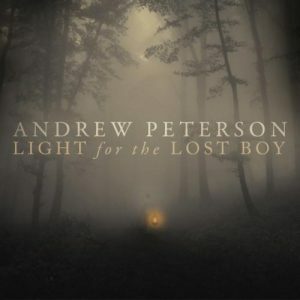 Counting Stars may be a favorite album among Andrew Peterson fans, but Light for the Lost Boy is his best work. Here we find brilliant lyrics set to music that encapsulates a palpable yearning for the Eden we’ve lost. I debated whether or not to include this album in this guide, since technically it is a compilation of Andrew Peterson songs. But because it contains several unreleased songs as well as several new versions of old songs, I thought it best to offer a brief review. In addition, there are a number of older songs that Andrew rerecorded for this compilation. For example, the 2014 version of “After the Last Tear Falls” is guitar-based instead of the softer, piano-based version we find on Love and Thunder. Andrew includes new versions of “Faith to Be Strong,” “The Silence of God,” “Nothing to Say” and “No More Faith.” The song that has been changed the most is “Isn’t it Love,” which on Clear to Venus has an upbeat melody crafted for radio airplay but here is given a slow and somber treatment that adds gravity to the lyric. “Holy is the Lord” fills out the story of Abraham from the brief chorus included on Love and Thunder. It wouldn’t be accurate to say that After All These Years is a “best-of” collection, since many of Andrew’s best songs are missing. It’s more like a musical memoir, an opportunity for the artist to reminisce and return to past works. 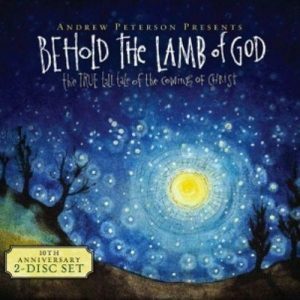 Featuring songs from all of his previous albums (except Behold the Lamb of God), this compilation serves as a good introduction to many of the themes in Andrew’s songwriting. I’ve been waiting for the sun To come blazing up out of the night like a bullet from a gun Till every shadow is scattered Every dragon’s on the run. “Every Star is a Burning Flame” captures once again a sense of enchantment at the world, but Andrew extends the idea so that not only is every star a burning flame, but every heart is, too. “We Will Survive” and “My One Safe Place” shine light on the perseverance necessary for a healthy marriage. The former acknowledges Andrew’s need for encouragement and the fortifying of his faith. The latter includes a nod to the Light for the Lost Boy (“I’m a lost boy out in the trees) and exults in the safety and comfort of home, where God reveals His goodness in the beauty of one’s spouse. “The Rain Keeps Falling” may be the most transparent song on any Andrew Peterson album (and since authenticity has always been a hallmark of his music, that’s saying something!). The song quietly chronicles the dark descent into depression, where pressures and sins and struggles overwhelm the singer like the constant and relentless falling of rain. Even here, though, we find a ray of hope as Andrew prays for rain to water the earth so that God will bring life from a season of death. 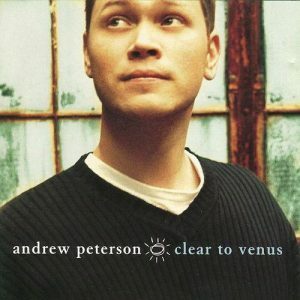 Most of Andrew Peterson’s albums contain songs that focus on relationships and the Christian life at the horizontal level. “I Want to Say I’m Sorry” and “Be Kind to Yourself” fill that role here. The first is a lament for a broken relationship. The second is for Andrew’s daughter Skye, a fatherly song of affirmation intended to calm the turbulent years of adolescence. “The Power of a Great Affection” testifies to the grace of God that brings forgiveness for the past and hope for the future, while acknowledging the joy of life in the present. The album ends with “The Sower’s Song,” an exploration of the truth that we must be broken by God before we can bear fruit, and a powerful declaration of the Word of God not returning void. 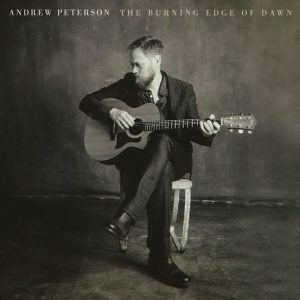 The Burning Edge of Dawn is a solid addition to Peterson’s work, marking a return to his traditional sound and offering a new collection of sing-able melodies and transparent lyrics. Ten years after the release of his acclaimed Resurrection Letters Volume 2, the long-awaited Volume 1 tells the story and explores the significance of Christ’s death and resurrection. I’ve been listening to this album for several weeks now, and I consider it to be one of his best, on par with Behold the Lamb of God and Light for the Lost Boy and far surpassing the beauty and power of Resurrection Letters Volume 2. The album begins with a “prologue” of five songs for Holy Week. “Last Words (Tenebrae)” sets the mood with seven last sayings of Jesus incorporated into a contemporary chant. “Well Done Good and Faithful” is a spine-tingling exploration of the significance of Jesus’ sacrifice as an offering to the Father who affirms the goodness of His beloved Son. This may be the strongest theological song that Andrew has ever composed (it is based on a hymn by Isaac Watts), requiring repeated hearings in order to fully take in all the biblical allusions. “The Ninth Hour” is a musical interlude that captures something of the joy and sadness of Jesus’ last day. “Always Good” is a quiet declaration of faith in the midst of terrible suffering, taking the puzzlement of the disciples at the cross and extending their sadness and confusion into our present circumstances, against the foundational belief in the goodness of God. Another brilliant song of biblical theology follows—“God Rested,” which parallels God’s work in creating the world (“Six days shall you labor, the seventh is the Lord’s”) with the day Christ’s body rested in the tomb. The song ends with a line about all creation waiting, and then the music stops abruptly, as if Andrew and the musicians are holding their breath in anticipation for what comes next. The blood that brought us peace with God is racing through His veins… The Lamb of God slain for us is a Lion ready to roar… He took that breath and put death to death. Where is your sting, O death? How grave is your defeat! “Risen Indeed” returns to the scene of the empty tomb, where Peter and Mary discover the reality of the Risen King, sovereign over death. “Remember Me” is one of two songs in this collection written by Ben Shive. A musical departure for Andrew, it stands out for the way it combines the cry of the thief on the cross with a dizzying array of biblical texts and allusions. Consider these lines about where all creation is headed, and try to sing along without weeping (I dare you!). The Son will stand on the mount again with an army of angels at his command, and the earth will split like the hull of a seed wherever Jesus plants his feet, and up from the grave the dead will rise like spring trees clothed in petals of white, singing the song of the radiant bride. “I’ve Seen Too Much” serves as a testimony to the power of tasting the resurrection reality of Jesus personally. “Remember and Proclaim” and “Maybe Next Year” bring together the past, present, and future of Christian hope, with the former focusing on the Lord’s Supper as a present declaration of past redemption, and the latter leading us to Jerusalem and the ancient hope that God’s kingdom will come soon. “Rise Up” is another song written by Ben Shive. Andrew’s musical rendition is Beatles-esque at times, while the words declare the judgment of God against all oppression and injustice. When we long for justice, we inhabit the worldview of the psalmist, who saw God’s final judgment as good news for this sin-soaked world. “Is He Worthy” enters into the drama of Revelation 5, when John the Seer wonders who is worthy to break the seal and open the scroll. From start to finish, the song invites the listener to respond liturgically—to confess our feeling that the world is broken and to affirm our faith in its future renewal. The beautiful match of lyric and melody make this one of the standout songs on the album. “All Things Together” puts Colossians 1 to music and begins to intersect at various points with the opening song of Resurrection Letters Volume II (“All Things New”), creating a bridge from the first volume to the second, and bringing to a close a brilliantly conceived and executed album that revels in the glory of Easter.